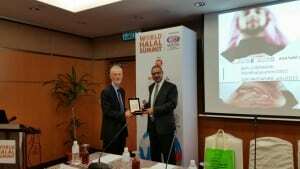 A delegation from Dubai International Academic City (DIAC) recently visited Kuala Lumpur in Malaysia to attend the World Halal Summit (WHS) 2015. Hosted by the Ministry of International Trade and Industry of Malaysia (MITI), WHS brings together key Halal players from the industry, as well as certifiers, scholars, and academics. The global Islamic economy encompasses a broad range of sectors, including food, pharmaceuticals, fashion, media, and Islamic finance. It is estimated that over the next five years, global demand for halal products will increase by between 15% and 20%. In the UAE, we are also seeing this trend as according to a study by Thomson Reuters, Dubai’s Islamic market has a potential value of $6.7 trillion, bigger than both the US and China. Research by Dubai Chamber of Commerce revealed that the global halal food market is currently estimated to be worth $667 billion, and is expected to grow to $1.6 trillion by 2018. Figures indicate that 20% of the current food trading around the world is halal, an increase from 16% in 2012. Dr. Ayoub Kazim, Managing Director of DIAC said, “We have the potential to develop a significant and substantial Islamic Economy, primarily by mobilising the vast number of student youth that currently reside in Dubai. On the industry side, the various sectors that make up our economy must lead the effort, and help to advise academic institutions on the courses, skills, qualifications required from graduates. DIAC is committed to creating synergies between its partners in order to identify and discuss the demands of industry. By providing training and knowledge development that is innovative and relevant for the future growth of both the country and this region – particularly in terms of Islamic economy growth, DIAC is playing an important part in the UAE Leadership’s vision of creating an innovation-led economy that will safeguard sustainable GDP growth.